A concert featuring Elizabeth Chang on violin and Alissa Leiser on piano took place last Friday as a part of the Charlotte Warner Concert Series in Rosse Hall. Through the dark and stormy night, audience members were treated to a performance that deftly wove together classic and experimental pieces. The concert opened with a fiery performance of Felix Mendelssohn’s Sonata in F Major. The piece swept from crescendo to plateau with ease, allowing the performers to demonstrate their musicianship and stage presence. The following piece, Sonata No. 2 by Charles Ives, exhibited a more experimental tone. It incorporated several Civil War and classic American hymns, including Nearer, My God, to Thee, the hymn played as the Titanic sank. There was a clear emotional impact, and it allowed for audience participation as some sang along to the more recognizable hymns. “The Ives Sonata was chosen by Ms. Chang…Ives seemed like a good balance in terms of it being written by an American composer and having a very different ethos than that of Beethoven or Mendelssohn,” said Ms. Leiser when asked about the choice of song. Locals, faculty, and students came out in force to support the act. The performers played to a full and enthusiastic house. 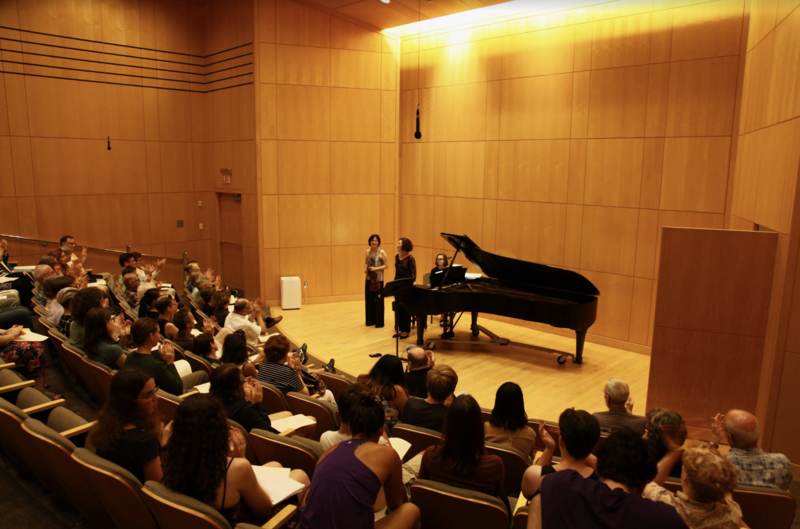 Chang and Leiser are both accomplished performers and teachers. Chang founded the Violin Duo Project, The School for Strings Intensive Chamber Music Workshop, and various other projects. She currently serves as an associate professor violin at the University of Massachusetts Amherst. Leiser has played on several radio and television broadcasts, festivals and CD releases. She co-founded the Buckley Chamber Players at Amherst College, where she taught until 2015. Leiser is also the mother of two Kenyon alumni, Steven ‘10 and Jeremy ‘13 Leiser-Mitchell. The pair have performed as a duo since 2008, after meeting in Amherst. They also play as part of Lighthouse Chamber Players in Cape Cod, where Chang serves as artistic director.